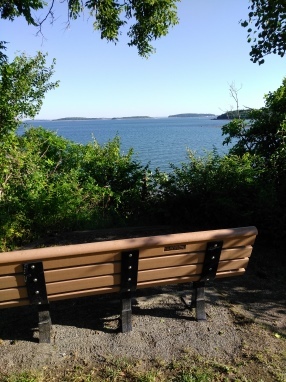 The hiking trails at Webb Memorial State Park are a great summer destination as they offer great views of Boston Harbor as well as being open and generally bug free. The hiking here is comprised mostly of a series of looping trails. 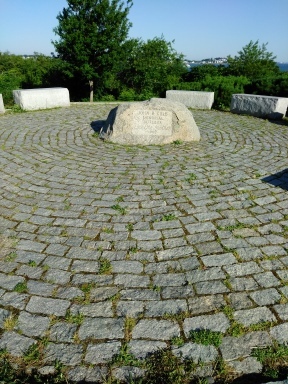 Along the way are memorials to Weymouth citizens that have made a difference in the community. 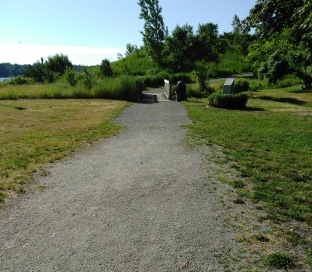 Being a park and not just a conservation area, this destination offers plenty of parking, trash barrels, picnic tables, benches, a water bubbler (great for dogs as well as humans) and rest rooms. 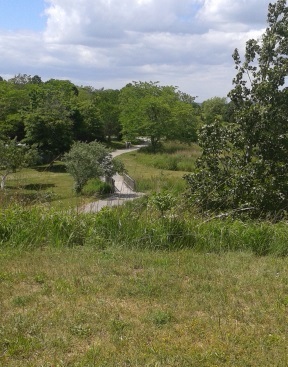 This park is maintained by the DCR (Dept. of Conservation and Recreation). 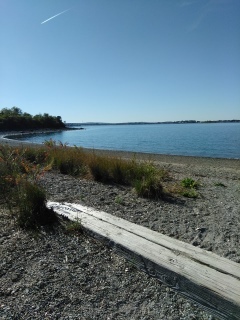 Another feature of Webb Memorial State Park is the rocky beach along most of the edges of the peninsula this park sits on. Great for sitting and sunning or a good launch site for kayaks. 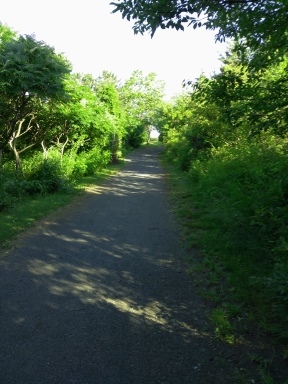 From the parking lot and heading straight up the wide gravel based road named Robert Ambler Way, the hiking trail climbs gently and becomes a more moderate incline. and arrives at a fork at .16.
right with mown lawns and a view of Grape Island. full vegetation heavy with bird activity. and mown grass side trails to the right. At .28 the hiking trail leads to the right and there is a narrow trail going to the left. In between is the John Cole Memorial on a bit of a hill with views of the harbor beyond. My visit here was on a perfect summer day, not too hot and breezy. After reading about John Cole take the narrow trail leading left. This circles the memorial a bit downhill and rejoins the main trail at .38. Going to the left here brings you back into vegetation. 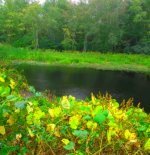 The vegetation here at Webb Memorial State Park is much like the vegetation on the harbor islands. Dotted with a few large trees but mostly shorter ones like the antler sumac tree also known as staghorn sumac. Shortly after returning to the main trail there will be some benches where the view opens up again. Here Peddocks Island is straight ahead and Grape Island is to the right. Webb Memorial is the perfect place for a picnic! before 1/2 mile comes to a picnic area. Taking a right the trail becomes gravel pavement. and more harbor views to the left. 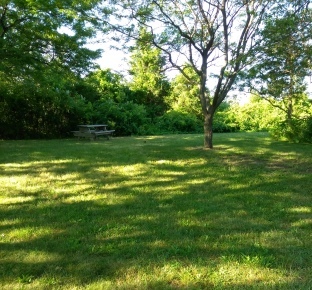 large lawn area dotted with benches. you back to the parking area. Heading straight and to the left will lead you on a loop trail on the lower end of the peninsula. 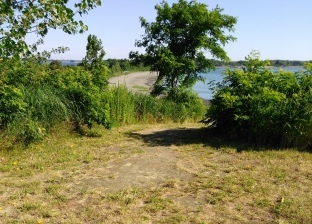 There is also a sandy side trail to the left leading to a polished rock beach. A bit of a beach explore added to the mileage of this hike. At .70 back from the beach heading left. and going left for the peninsula loop. leading down to the same beach. At .81 the trail comes to a lawn area and more views. Now the Fore River Bridge comes into sight. At .85 can see the return portion of the trail to the left and another memorial. At .88 we reach the tip of the peninsula. 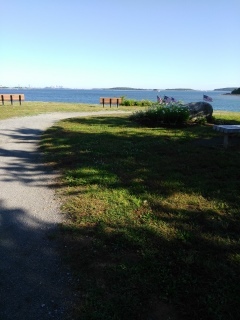 Here you can see most of Boston Harbor, Hough's Neck in Quincy and very close view of Grape Island. to the Grape Island Alarm. and then the beach opens to the left. from Hewitt's Cove running through this area. 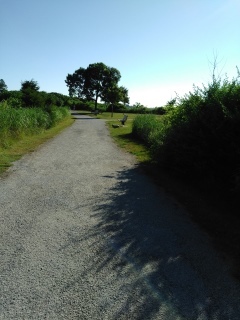 To the right is another mown lawn trail. These can extend the hike considerably and are great for bird watching. Approaching the Donald F. Haviland Memorial with a flag. 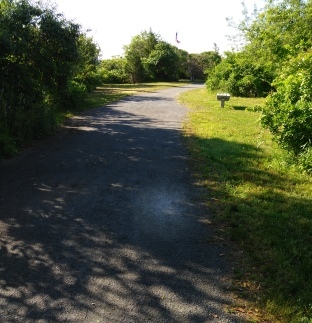 trail down to the beach area. A few steps later we arrive back at the loop intersect and heading straight leads along the Hingham harbor area. 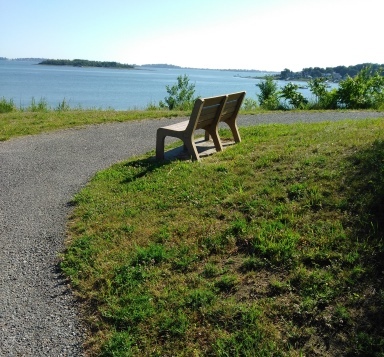 Across the water from the Webb Memorial State Park is Hingham and the Bouve Conservation Area. At 1.21 there are more lawn trails to the right. Shortly after a bench and trail to the beach on the left. A few more steps and there will be a wide entryway to the beach, great for getting a kayak to the water. rest rooms will be on the right. bringing you to Mary's Point. maintenance area and additional parking. and the lighthouse beyond on an island. 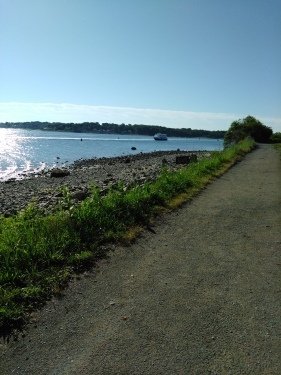 The trail continues uphill and turns to the right with views of Hingham shopping area and the ferry wharf. At 1.53 the top of the point or hill with more benches and picnic tables. The trail can be continued by either turning around or following a steep little informal sandy trail down the hill straight ahead. One aspect this website likes to cover when possible is any history of an area covered. The memorials in this are a big part of Webb Memorial State Park. Prior to becoming the park it is today, the peninsula was part of the Bradley Fertilizer Factory and unfortunately was used to dump industrial waste in the late 1800's. Later in the 1950's it housed missiles for the Nike missile project which helped create this country's first operational anti-aircraft missile system. 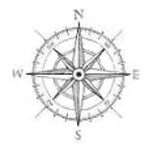 The site was deactivated in 1974 and transferred to the Commonwealth of Mass. in 1977. It opened as the Webb Memorial State Park in 1980. 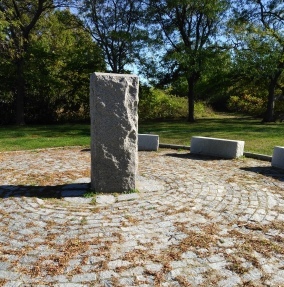 It is now part of the Boston Harbor Island Parks and the only land based part of that park system. 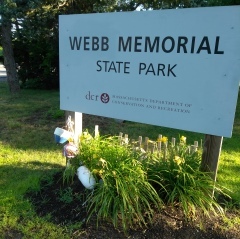 The park itself is named after a Weymouth police officer and WWII veteran William K Webb with state documents referencing him as a Captain. 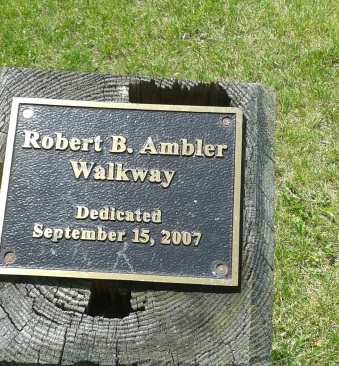 The main walkway around the peninsula is named the Robert B. Ambler Way. Named after a Town of Weymouth Selectman who had been noted for his long term service and dedication to the town. Walking the hiking trails in the order of the trail guide suggested for this park, what is the largest memorial is the Cole Memorial. 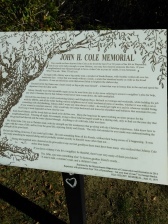 Named after a man named John H. Cole originally from South Boston who made his home in Weymouth for 25-30 years. He worked for the MBTA and must of been quite the remarkable man as a long description is etched on a stone tablet relating the kind of man he was. The memorial is dated 1980, the year the park was opened. 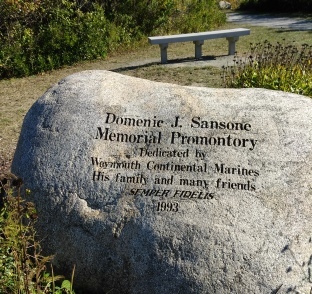 At the far end of the peninsula is the Domenic Sansone Memorial. A Weymouth continental Marine with a 1993 date on the memorial. 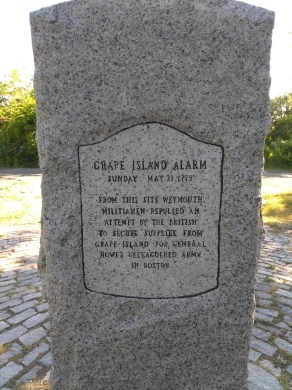 Behind the Sansone Memorial is the Grape Island Alarm memorial. It looks much like the Cole Memorial but not as extensive. Grape Island was the site of a revolutionary battle and some refer to it as the Grape Island Straw Alarm. 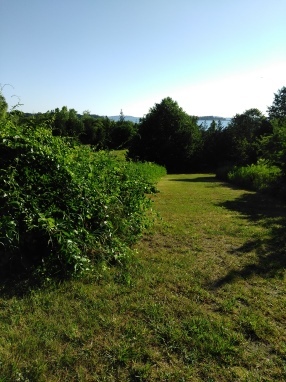 In 1775 the island was home to a private farm owned by a Elisha Leavitt who was a loyalist. Loyal to the British troops. As their supplies ran low, they came to the island to secure hay for their horses. The Patriots watched from the shore but were unable to retaliate till the tide came in and were able to launch their boats. When they did arrive they forced the British Troops off the island and burned both the hay and the barn that housed it to the ground. 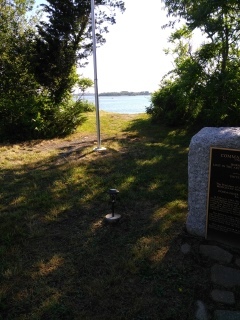 The Haviland Memorial with a beach access trail. 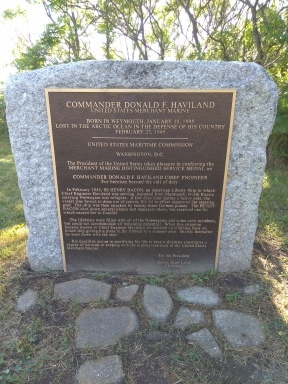 Continuing on is another interesting memorial at Webb Memorial State Park to Donald F. Haviland. Born in Weymouth in 1895, he became a merchant marine. He was lost at sea in the Artic Ocean in Feb.1945 while defending the country. He was the acting Chief Engineer aboard the SS Henry Bacon, transporting Norwegian refugees out of Russia. 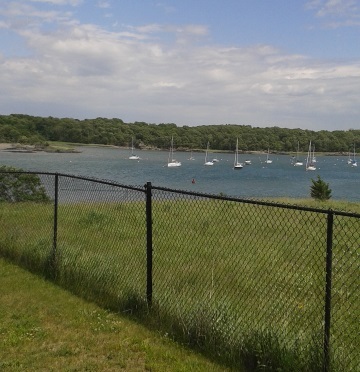 Beautiful beach and harbor view from the Haviland Memorial. The ship was forced to drop out of a convoy it was part of to repair the ship. During the repair stop they were attacked by German planes. The German's were able to deliver a hit that damaged the vessel. With all the refugees aboard there were not enough lifeboats for all. Once hearing this Chief Engineer Haviland climbed back on board giving his seat to a younger man. He went down with his ship! He received the Distinguished Service Medal for heroism above and beyond the call of duty. The view from Mary's Point. 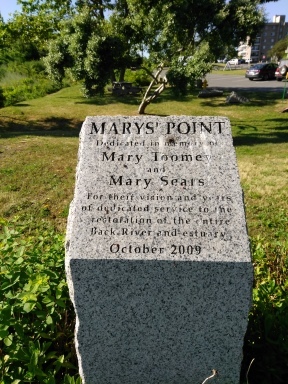 Continuing on to Mary's Point, the memorial for the two Marys for which it was named after. Mary Toomey and Mary Sears for their years of service and commitment toward the Back River and it's estuary. It is notable that Mary's Point sits on it own hill which is a classic example of a drumlin. Geology of the area states that the peninsula is a series of three connected drumlins. Drumlins are glacial creations and many times cluster into a field of drumlins. They are small elongated hills, one end with higher elevation almost like a cliff and a sweeping end that meets the ground. If anyone has any personal insight or stories of the people listed above, please do share below. Large parking lot can handle up to 30 vehicles. Additional parking near the maintenance building.